It’s possible (likely) that he is correct – birds are born knowing the basic song of their species and pick up local ‘dialects’ from hearing adults sing. Hearing a great adult song imparts information to the female bird – as does hearing a crap song and spiders are born knowing how to spin a web etc. I have no problem with having an existing part of an animals anatomy altered by evolution (cells that can separate light and dark become eyes) but I have trouble understanding how such a complex form of physical behavior becomes part of an animals genetics. Has anyone deciphered the genome of a bee? If so, where’s the dance? Stephen Anderson does state that bees raised in isolation, lacking any experience with dancing, will nevertheless dance correctly as soon as they are introduced to a hive, but I haven’t tracked down the underlying research in this area and I’m not sure how well established this is. In poking around just know, I did see at least one study that supports makes it sound like your analogy to bird songs may be spot on. In this research, bees of two different species were raised in a single hive, with the two species learning each other’s separate dance “dialects” and successfully communicate. Here’s a link to the paper, if you’re interested: http://www.plosone.org/article/info%3Adoi%2F10.1371%2Fjournal.pone.0002365. 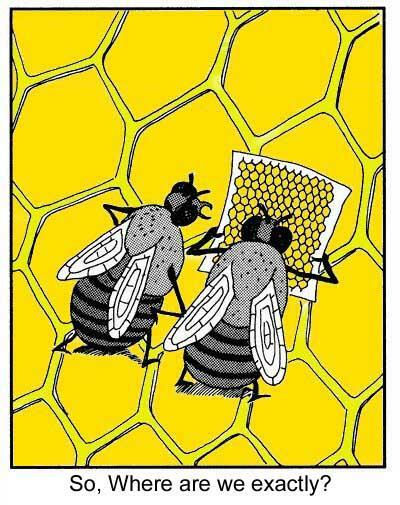 Also, yes, the honeybee genome has been sequenced! The full genome is available in a database called BeeBase, and there’s a resource center for the project maintained by the National Center for Biotechnology Information at http://www.ncbi.nlm.nih.gov/projects/genome/guide/bee/. To my knowledge, a clear genetic basis for bee dance behavior has not (yet?) been pinpointed, but – as you’ll see if you start looking at the genome resource center – there’s an awful lot of research going on. Fascinating times!